An ERP industry standard for decades, Oracle is committed to EBS product support and future 12x releases through 2030. To SkyBridge, this product commitment is particularly exciting. This is because we have a deep history of optimizing EBS, along with building and supporting applications. While on-premises may not get the same attention it did before in ERP, the reality is support and optimization needs will be there well into the next decade. We help organizations implement, upgrade and optimize EBS. For most today, this is going to mean modernizing to the latest version of R12. Whether your company needs help evaluating and prioritizing the deployment of new functionality or you are looking for a partner to manage the implementation process for you, SkyBridge has a set of proven services that are tailored to your business requirements. To outpace the competition and stay current in the global market, organizations are rapidly switching from their current systems to Oracle’s proven EBS systems. SkyBridge provides a high performing approach, methodology, tools, and techniques for organizations embarking into EBS implementation, reimplementation, migration and upgrade. SkyBridge’s comprehensive phased approach ensures that the Oracle implementation aligns with your business strategy and goals. 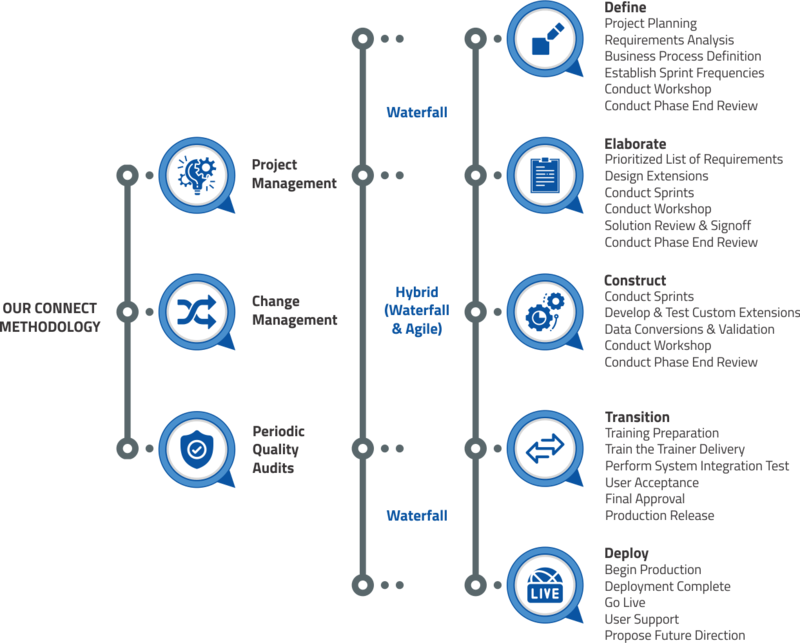 We follow both a top-down and bottom-up approach to deliver process alignment, application architecture, design and finally a detailed implementation. SkyBridge’s optimization approach for EBS focuses on all aspects of enterprise wide IT systems, incorporating our detailed framework for People, Products, Processes and Performance. Our solutions strategy and implementation plan is completely based on the enterprise size, needs, and and future growth. Building on Oracle Unified Methodolgies (OUM), Connect leverages waterfall, agile, and hybrid.